It’s that time of year again. The avocados are ripening on the trees, the daily rains are drying up, and the English teachers of the SAVA region are meeting once again for an annual training workshop. Based on the success of last year’s training in Sambava, the Education Volunteers of the SAVA region were happy to organize and present a similar pedagogy training workshop. Our goal was to share new teaching methods with English teachers and encourage a professional exchange of ideas. We recruited new teachers that did not attend the training last year, but also invited some alumni teachers to further enhance their skills. All together, there were 50 local English teachers in attendance during the 4-day training workshop held in Andapa. 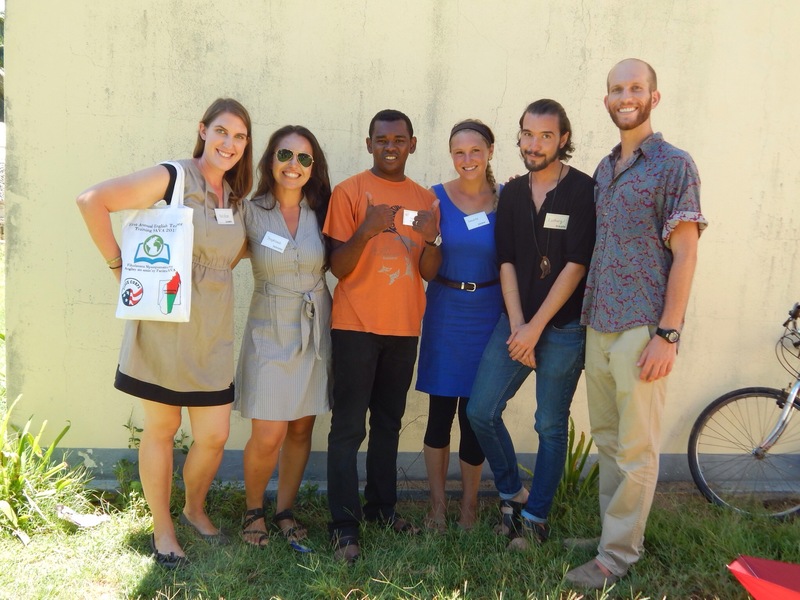 Prior to this year’s event, I worked very closely with two of my Malagasy counterparts in Andapa and I also collaborated with the other PCVs in the region. 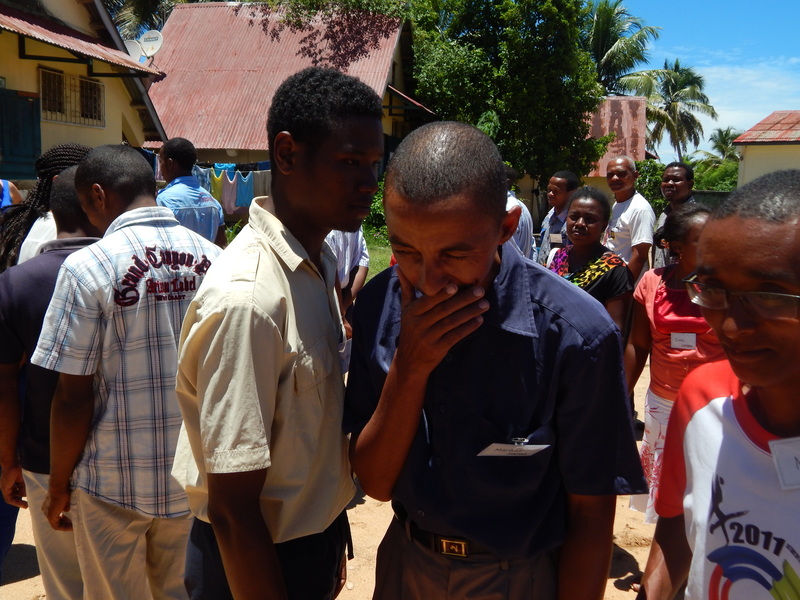 Johnny and Deriot, my Malagasy colleagues, were absolutely essential in making this training happen. Johnny has a knack for translating English to Malagasy, so he helped me a lot when we needed to translate radio advertisements and recruitment posters. Deriot is the kind of guy that knows everyone and has connections and solutions all over town. Need 30 mattresses for teachers to sleep on during the training? Deriot can get them. Need to collect cooking materials like pots, plates, spoons, and forks? Deriot’s got your back. 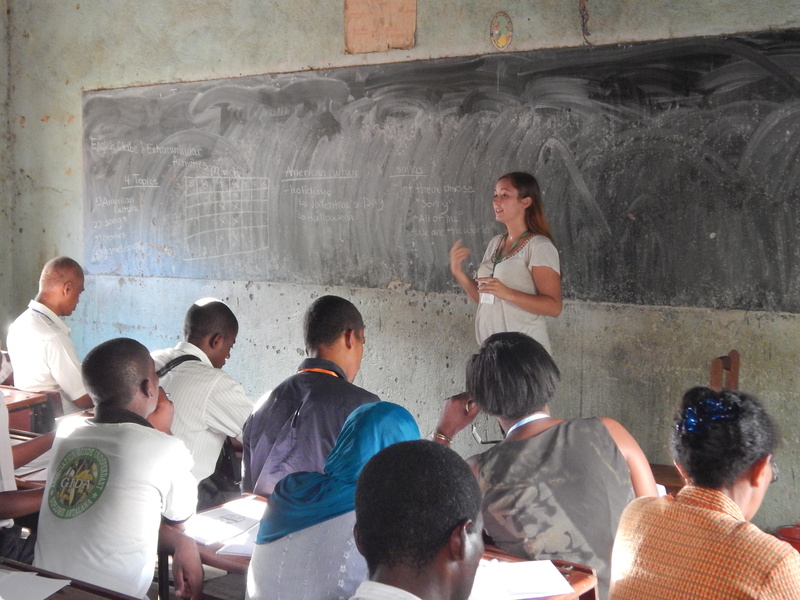 Within each of the four Districts in SAVA, the Peace Corps Volunteers living there played an essential role in recruiting teachers, organizing local travel to Andapa, and preparing to facilitate training sessions. This project was truly a team effort. On the first day of the training, the teachers arrived in Andapa throughout the morning and got settled in. 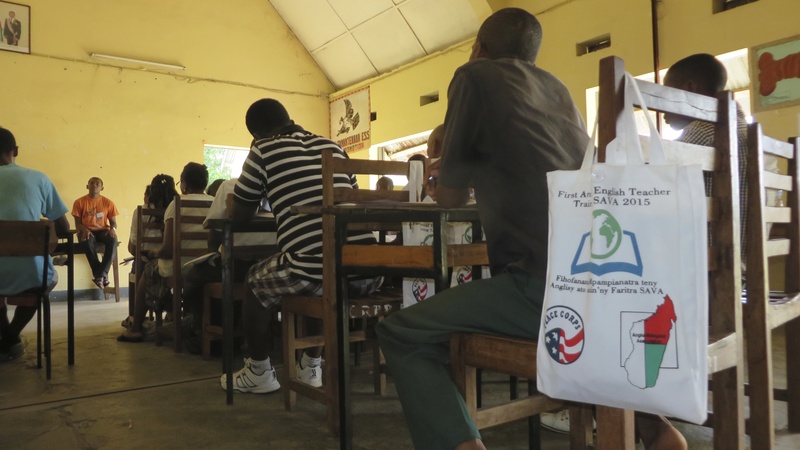 The training was held at a local elementary school and we utilized the classrooms for meeting space, a dining room for meals, and sleeping areas. We had a group lunch together and then kicked off the program with a welcome message from the Chef CISCO (superintendent of the school district). After a couple of icebreaker activities to get to know the teachers, our first real session was “The Role of the Teacher and Motivating Students.” This session was facilitated by a Volunteer and his Malagasy counterpart, which is something we encouraged this year in order to give more responsibility to the Malagasy teachers and slowly show them that they are able to organize similar trainings on their own. Some of the teachers told me that they appreciated this first session because it set the tone for why they were attending. Before you can perfect your teaching skills, you have to take a step back and consider what a teacher should be doing and how a teacher can support student growth. The second day stated off with a session about learning styles and lesson planning techniques, facilitated by Deriot. This session helped teachers prepare for their lessons and introduced the idea that students learn in different ways (auditory, visual, kinesthetic, etc) and the activities that a teacher uses in a lesson should appeal to these different learning styles. The rest of the sessions that day were new topics that were not covered in last year’s schedule. One session was about giving feedback to students and correcting their errors. 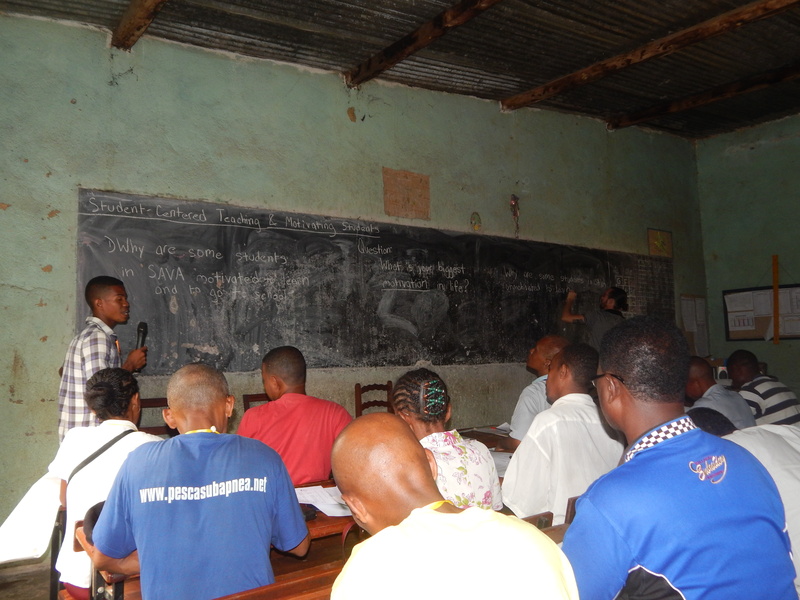 The next session, facilitated by another Malagasy teacher, was about gender equitability in the classroom. 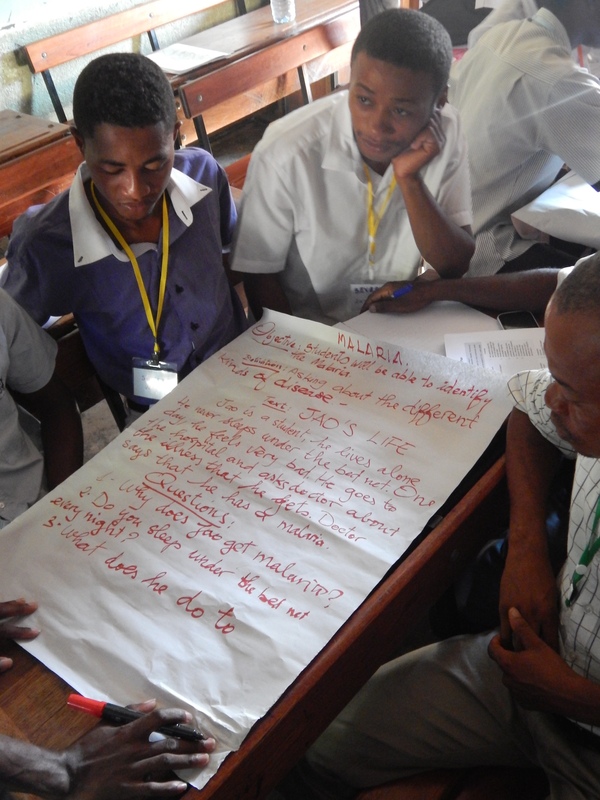 This is a priority issue for Peace Corps Madagascar across all the different types of work that we do, so it felt right to include some information during our teacher training. I think a handful of the teachers didn’t even realize how they previously treated boys and girls differently in their class, but hopefully now they have a fresh perspective and can make some actionable changes. We wrapped up the day with a session about organizing English clubs and other extracurricular activities. Many of the teachers also take time out of their busy schedule to help with local English clubs, so we shared some new ideas and activities that they could use in that setting. We emphasized the idea that learning a language is something you need to practice and use frequently, so having a vibrant extracurricular program where students can explore English and have fun is very beneficial. The sessions on the third day were facilitated by different PCVs. We started the morning off with two sessions that together covered the basics of how to teach reading, writing, listening, and speaking activities. Some teachers don’t feel confident in their own English abilities, whether it’s speaking or writing or whatever, so maybe they don’t give much attention to one or more of these essential language skills in their classroom. We wanted to show them how they could bring these skills back into their classroom. In the afternoon, we offered a session about incorporating malaria education into the English curriculum. Malaria is something that impacts our local community a great deal every year. Students get sick and miss school, teachers get sick, family members get sick and sometimes die from malaria complications. So we wanted to give our English teachers the power to talk about malaria in their classrooms and give students at least one more point of exposure to prevention and treatment information. The final session of the day was about teaching with limited resources, something that every Malagasy teacher is used to. In most cases, teachers in this country get nothing more than a blackboard and chalk to teach with. In this session, we listened to the experience of the teachers more than teaching them from our comparatively minimal experience. It was a great exchange of ideas and I think everyone learned new ways to incorporate inexpensive or free resources. Sometimes we have to be creative and design our own teaching resources. The fourth and final day of training was about bringing all the new information together and making a plan to move forward. The first morning session was led by a Malagasy teacher and he talked about creating a professional network of teachers to continue sharing experiences and exchanging teaching methods. This is essential if we hope to spread the lessons learned during the training and continue improving the quality of instruction in our region. At one point, teachers from each District met together and discussed the specifics of when they would meet again to share ideas. To wrap up the training, we asked the teachers to recite and sign a pledge that described how they would share the knowledge they gained during the training and reaffirming that they have the ability to enact change without the supervision of a foreigner. Then we gave a certificate of completion to each teacher, posed for many photos with the teachers, and shared one last meal together before teachers started to make their way back to their homes. It was a really great ending to a phenomenal training program. Overall, based on feedback from the teachers and the PCVs involved, it was a successful event and everyone can’t wait to do it again next year! Throughout this process, and having participated in the first training program last year, I learned so much. I learned about myself and my work ethic, my ability to share a vision with people, and my ability to stay calm and focused in the face of ambiguity and other challenges. I got quite the education in the whole grant process including writing, budgeting, evaluating goals, and reporting results. Maybe most importantly, I learned about finding joy and purpose in my work here. All the stress and frustration and confusion of the past 6 months melted away when I saw how proud and excited these teachers were to hold up their certificate of completion. I knew it was worth it when I heard the teachers reciting their pledge and saw the look on their faces like they deeply believed what they were saying. I owe a lot of thanks to many, many people. More than I could properly put down in words here. But I’ll try. A tremendous amount of thanks goes to the generous Americans who donated to our grant and basically funded the entire program. I also worked closely with local school officials and teachers to help spread the word about the training and secure some of the logistics during the event. 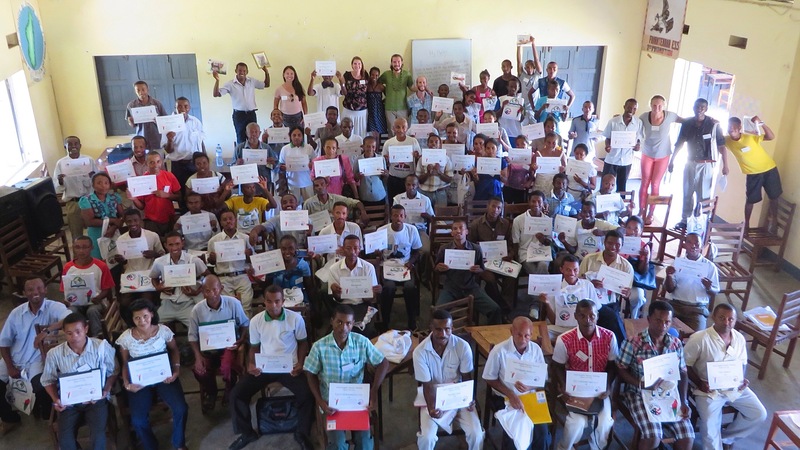 This project would have also been nothing without the interest, dedication, and participation of the 50 Malagasy teachers that took it upon themselves to improve their careers. As I mentioned before, a huge amount of thanks goes to Johnny and Deriot and the other Malagasy teachers that worked with us. And I really owe a lot to the amazing Peace Corps family that supported us throughout this endeavor. 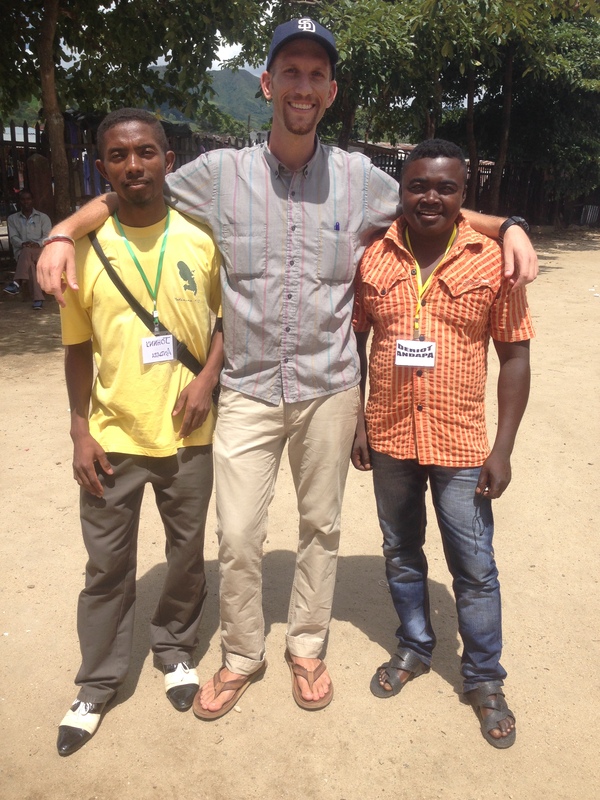 The PCVs in the SAVA region were instrumental in so many ways and it was such a pleasure to work with them. They willingly took on responsibilities to help share the workload. 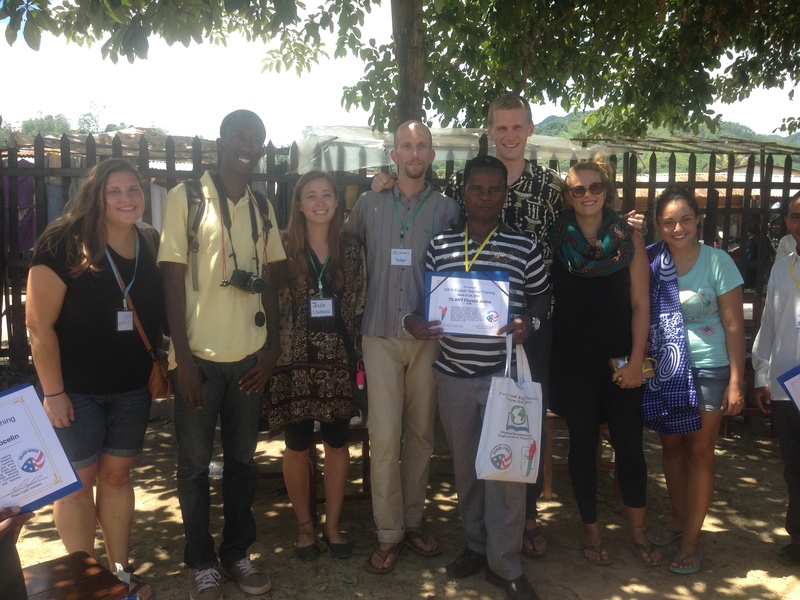 Other PCVs shared ideas for sessions and gave unwavering support throughout the whole process. And finally, thanks to the Peace Corps staff that helped us work through the grant process and helped us realize the full potential of this project. To all, I offer my sincere gratitude and appreciation. Having a good time with the team of English students that cooked every meal for the training and made sure we were well fed! Me with most of the participants from Andapa. Look at all those big Malagasy smiles! Ask any American and they can probably tell you about a teacher that had a lasting impact on them. A teacher who challenged students, inspired them, and encouraged intellectual growth during such a formative time in a young person’s life. 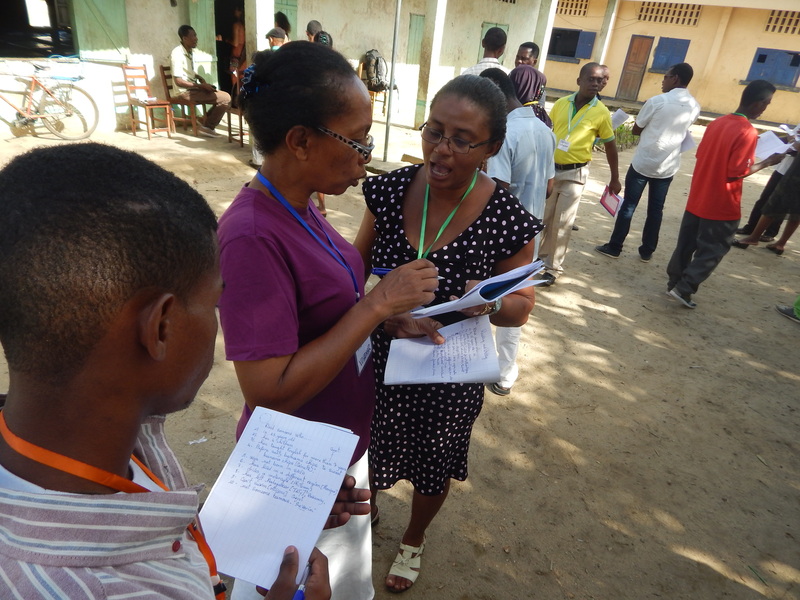 In Madagascar, it is more difficult to find such a relationship between teachers and students. Part of the difference is certainly cultural and that won’t change very easily. All too often in this country, teachers are viewed as the infallible keepers of knowledge and they pass on this knowledge through dictation and rote memorization. But part of the difference is also due to a lack of quality training for teachers. Unlike in America, formal education or training for a teacher is not always required in Madagascar. This reality is often the root of many issues in the Malagasy educational system. Students aren’t engaged. Some teachers, who never wanted to be teachers in the first place, get stuck in the classroom because it can be a reliable job. As a Peace Corps Volunteer, one of my job assignments is to help improve the quality of English instruction in my community. During the last year, I have collaborated with local teachers, shared experiences, listened to them more than I have talked, and offered suggestions based on my limited training. But there is more that can be done. 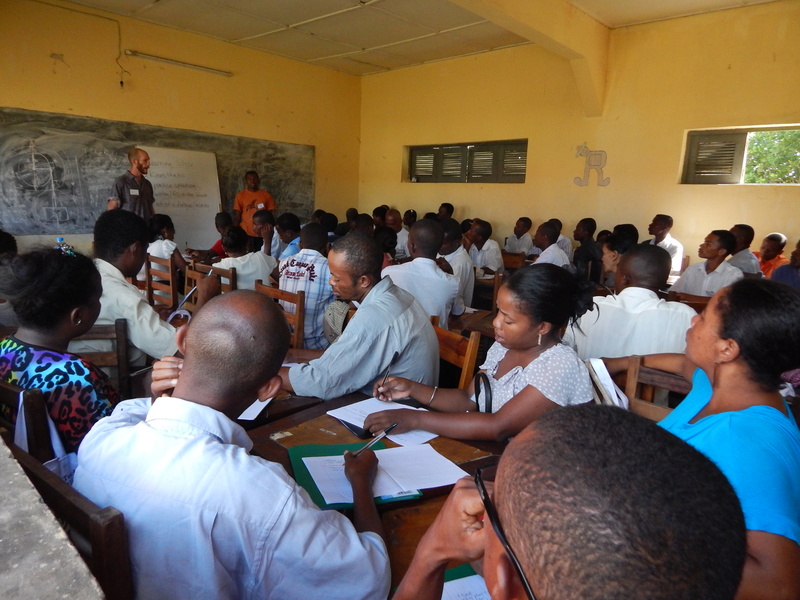 With the help of 5 other Peace Corps Volunteers in the SAVA Region of Madagascar (the region where we live), we are organizing a 4-day regional teacher training workshop to address the issue of instructional quality. 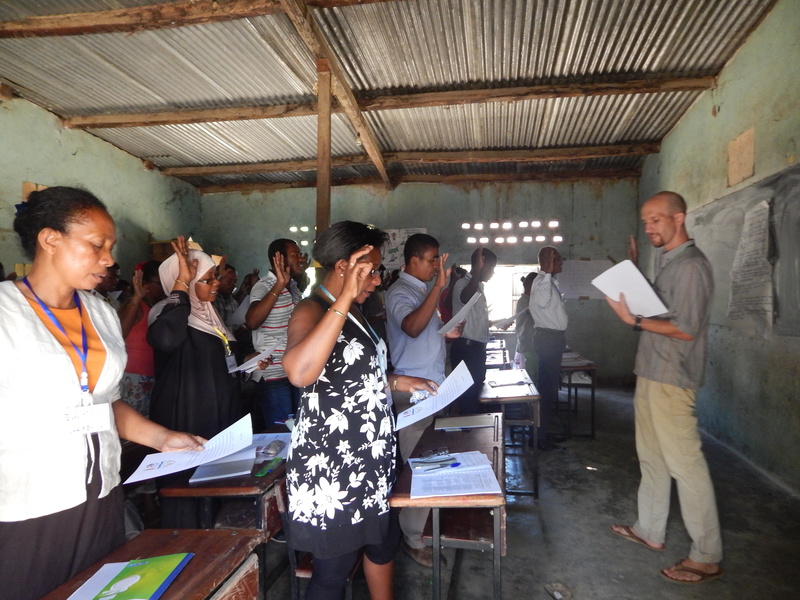 If a person lives relatively close to one of the few major urban centers in Madagascar, they might have greater access to government teacher training programs, but such training is rarely ever a requirement to be a working teacher and thus it is not always encouraged. But with the added incentive of working with “foreign” teachers, especially Americans, we hope to attract 60 teachers from all around the region to attend out workshop. It’s important to us that we reach not only teachers in the urban centers, but also those in the more remote countryside villages with even fewer resources. To read about the success of the inaugural teacher training that we put on last year, you can read my blog post about it here. To fund our ambitious program, I have applied for a grant through the Peace Corps. 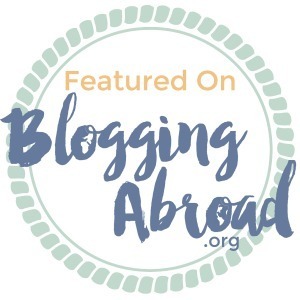 This particular type of grant is part of the Peace Corps Partnership Program, which means that the grant is funded by private donations rather than a government budget. With this type of grant, the community must contribute at least 25% of the total cost of the program, either through donated materials or in-kind donations like time and meeting space. The rest is up to us to fundraise! The grant also has to be completely funded before a single penny (or Ariary, in this case) gets to the community. When that happens, the funds will come to me and I will purchase all the needed materials. When we finish the program, I have to provide receipts for all costs and that prevents me from running away with all the money you have so graciously donated to help my community. The grant is structured in such a way that I cannot segment any of the costs during the fundraising phase, so all donations go into the general budget. If you’d like to make a donation or read more about the project, please visit our fundraising page here. I, and the team of Volunteers working on this project with me, would greatly appreciate any support you can give us. Whether that is making a donation of any amount or helping to spread news of our project by sharing the fundraising page with others. Every little bit of effort adds up and it can help bring some much needed resources to a great community of educators. 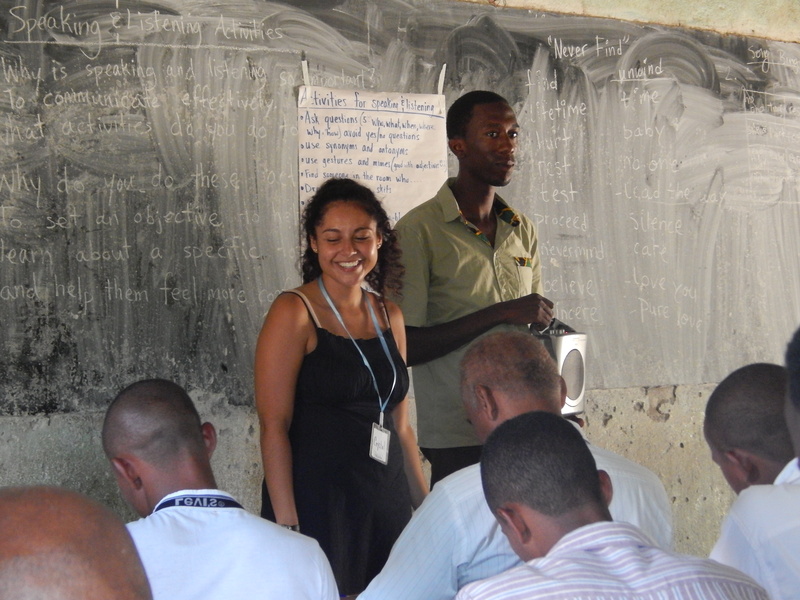 As an Education Volunteer in Madagascar, my primary assignment is teaching English to secondary school students. Another aspect of my assignment is to help improve the quality of English language instruction overall by working with and training other Malagasy English teachers. During the two years that I will serve in my community, I can personally impact only a small number of people, and then I will leave. But by helping Malagasy teachers improve their own teaching methods, the hope is that they will continue to inspire and teach exponentially more students for many years. In the spirit of cooperation and professional development, the 4 other Education Volunteers in the SAVA region and myself recently organized a 3-day English teacher training workshop. We recruited 64 English teachers from across the entire region, brought them together in the regional capital city, Sambava, and then worked with them on a variety of education topics. This event was especially significant because we believe it was the first time that only English teachers from the whole region had come together to meet in a professional setting. Usually, English teachers are not singled out as a group and they rarely get to interact with other English teachers from other towns. Needless to say, we were very excited for this opportunity to bring the teachers together. Before the SAVA Teacher Training had begun, I worked for many months with the other Education PCVs to develop, coordinate, and prepare. The long process started last year when another PCV from our area wrote a grant proposal to get funding for the training. When the grant was approved, we could really start working to recruit teachers by making announcements on local radio stations, posting informational flyers, and visiting schools to encourage English teachers to apply. At first, it was challenging to get enough teachers to apply so that we could meet the minimum number of teachers needed according to the grant proposal. After a few weeks of relentless encouragement and advertising, we actually received more applications than anticipated. For example, I got 28 applications from teachers in Andapa and I had a budget that could only accommodate 18 teachers. Then, just a few weeks before the event, we coordinated the logistics needed to bring all these teachers together in one place and host them for three days. The workshop took place at the Teacher’s College in Sambava. We facilitated our sessions in the main auditorium and the participants could eat and sleep in a few of the other classrooms. It was our responsibility to coordinate transportation for the teachers to get to Sambava and then return to their respective districts after the training was finished. We also provided all meals during the training, which meant buying food and delegating cooking duties to a team of insanely helpful local university students who are studying English. This entire training event was a massive group effort that was beautifully executed with the help of all the PCVs in the region and one of our Malagasy counterparts, Guyot. By the time the training was scheduled to begin, we were ready to make the most of our time together and share the experience with our Malagasy colleagues. 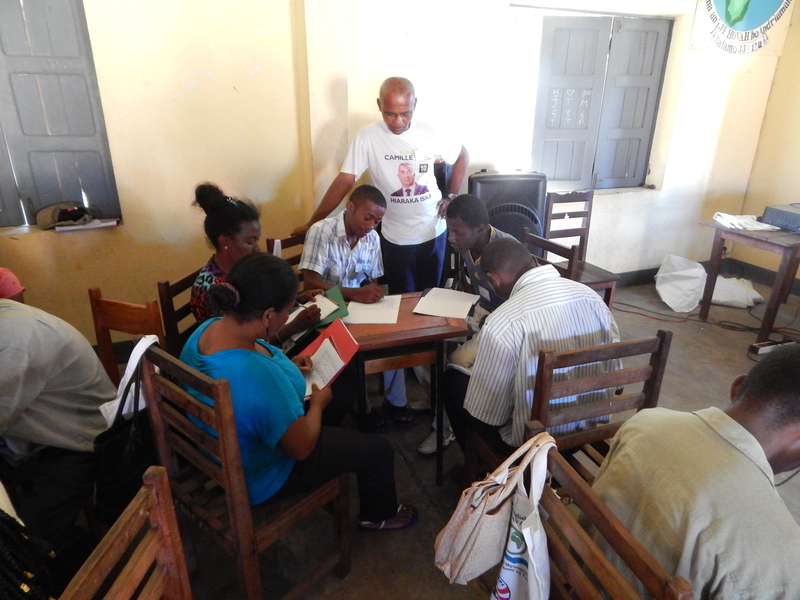 During the 3-day event, each training session was facilitated by a different Volunteer. The topics were selected based on their relevance to teaching English as a foreign language and also to address a few issues that are affecting the Malagasy education system. We covered topics such as motivating students, classroom management strategies, activities for teaching the four main language skills (reading, writing, speaking, and listening), and lesson planning. Our goal was to open a discussion about these topics and talk about new methods that could be used to better support a student-centered approach to learning. All too often in this country, teachers of all subjects will simply write information on the blackboard, make the students copy it down, and then leave. Especially in terms of teaching a foreign language, this method is practically useless because the students get little to no opportunity for using the language skills. We also wanted to emphasize the ideas that a motivated student will retain more information, language teachers should serve as guides during the learning process, and sharing knowledge with other professionals is essential to improving the quality of teaching in this country. During all the sessions, the teachers seemed to be very engaged, curious, and willing to share their experiences. In my opinion, this was the best way to highlight positive behaviors and learn ways to improve existing approaches. One of my favorite parts about the training was the opportunity to meet other English teachers from my own area and also from other parts of the region. During the recruitment phase, I was able to introduce myself to almost all the other English teachers in Andapa and some teachers from surrounding villages. 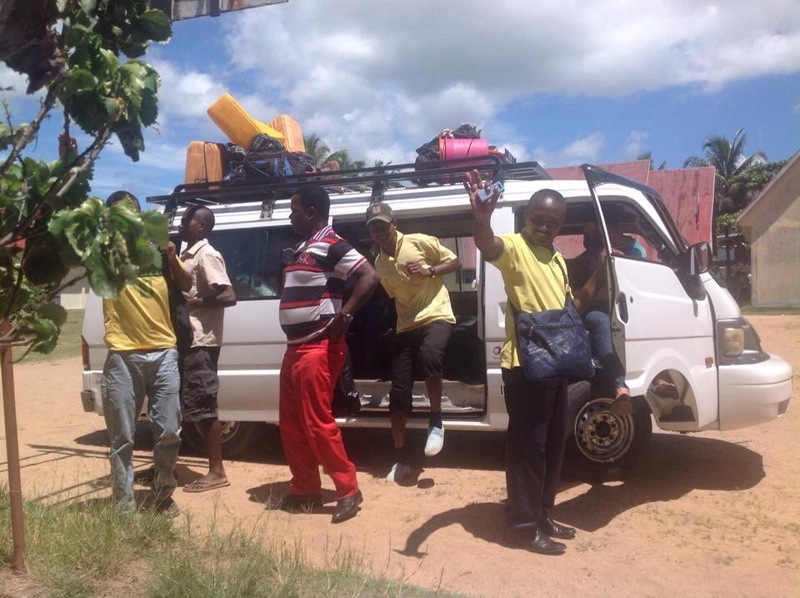 When we all arrived in Sambava, it was a networking goldmine of teachers. I feel more connected to the community of teachers in SAVA than I ever have before. Building on those connections, I’m excited about future opportunities to collaborate with and support other English teachers. When it was all over, I think the general consensus among the PCVs involved was that the program was a huge success. We all worked our tails off before and during the training, so we were relieved to finish up and celebrate our job well done. I can’t emphasize enough the importance of our group effort by combining American and Malagasy ambition to organize this training. Moving forward, we hope to offer another training workshop again next year and invite other English teachers to help spread the knowledge. The festivities continued the following day with athletic competitions between some of the schools. The boys played soccer, pitting the public school students against the private school students. The girls hosted a basketball tournament, also organized between public and private school teams. I attended one of the soccer matches and got to support my public school students as they beat the private school kids. It was really exciting, almost like a campy 90’s movie where the scrappy local team goes up against the fancy and well equipped jocks with nice uniforms. They fought hard and won an honest match, and the bragging rights that go along with it. I thoroughly enjoyed my first time participating in Journée des Écoles and celebrating with my school. It was inspiring to know that the entire country supports the idea that schools and teachers should be appreciated and cared for, so much so that they dedicate a specific time every year to do just those things. Sometimes as a foreigner, it’s difficult to feel comfortable and well-adjusted in a new community. But this experience made me proud to be a teacher in Andapa and I really felt like my colleagues consider me to be on equal footing with them.